The 2010 ROC Network Summit brought together California’s most creative and influential food and agricultural leaders from across the political spectrum to support the transformation of California’s food and farming system. 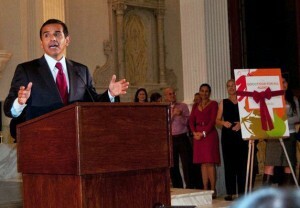 The summit took place October 6 – 8, 2010, in Los Angeles. The network summit was a new phase in our work to ensure a healthy and prosperous food and farm economy in California. ROC has taken a huge step forward by introducing the results of the Strategic Mapping Project and launching a history-making policy campaign. The “California Healthy Food & Agriculture” Platform sought to inspire legislators to craft future-focused state policies that ensures a healthy and prosperous food and farm economy in California. The summit featured debates about the planks of the platform. ROC recognized successes and key leaders in the California food system [link to changemakers WWD.02.11] and identified ways to scale projects and build capacity within the greater food community. To learn more, please review the Summit agenda below with more details about the opening reception, “Taste of the LA Foodshed,” confirmed speakers, panel presentations, invited politicians and much more. Error: Error validating access token: Session has expired on Tuesday, 26-Mar-19 12:54:16 PDT. The current time is Sunday, 21-Apr-19 07:08:49 PDT.